Every woman has that go-to outfit she reaches for when she needs an elegant look that's perfect no matter what the occasion. The same can be said for jewelry. So we put together a collection that will guarantee you a perfect, go-with-everything accessory. Neutral colors are eternal fashion staples that simply never go out of style. They are versatile and can be combined with any color and any outfit. 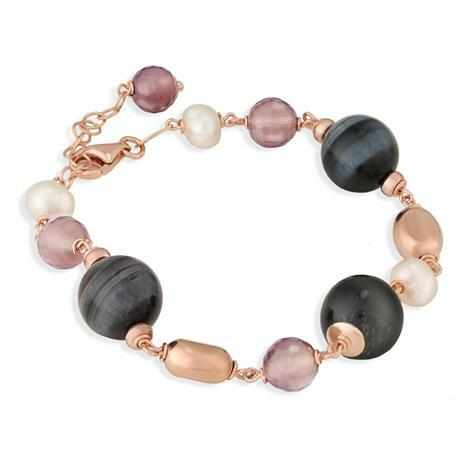 The Neutral Beauty Collection features charcoal tiger’s eye, smoky agate and creamy freshwater pearls in warm rose gold-finished settings. It’s a stunning fusion of neutral colors that have the added benefit of rose gold, solving that yellow gold versus silver dilemma–– as it strikes the perfect middle ground. Effortless and simple, classic and chic––every woman’s collection needs a neutral wonder.